A question which is frequently asked is how could the F-22A Raptor be employed in maritime strike (ASuW) roles, given that its basic air-ground weapons configuration is currently optimised for fighter-bomber and lethal defence suppression roles (DEAD). Maritime strike is an important role for Pacific Rim operators, such as PACAF and Australia. There are no fundamental impediments to the integration of an external anti-shipping missile, carried on the F-22A's wing pylons. 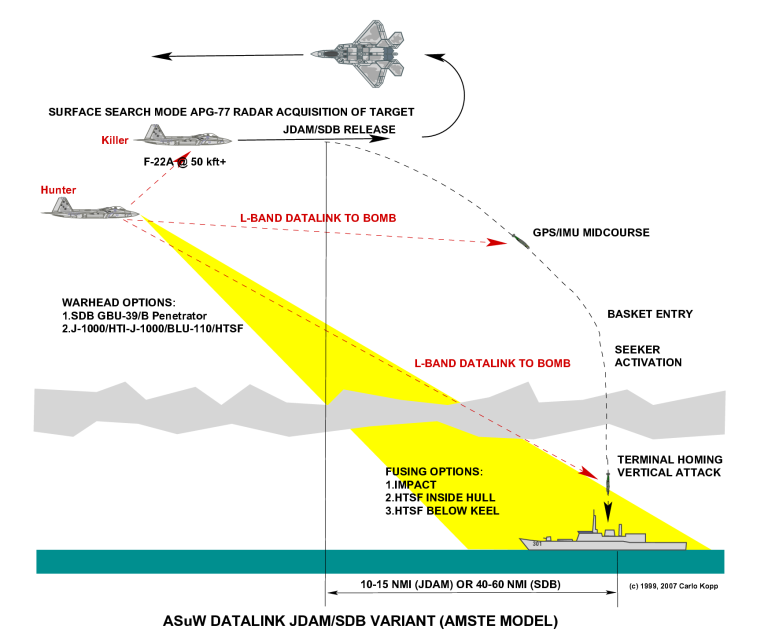 Given that the legacy AGM-84 Harpoon series lacks the survivability to tackle the most recent generation of Anti-Ship Missile Defences (ASMD), the most practical candidate for such a role would be an anti-ship variant of the AGM-158 JASSM, being acquired now by the RAAF. The drawback of this approach is that subsonic profiles must be flown with the missile attached - given the range of the JASSM/JASSM-ER stealth is simply not an issue. 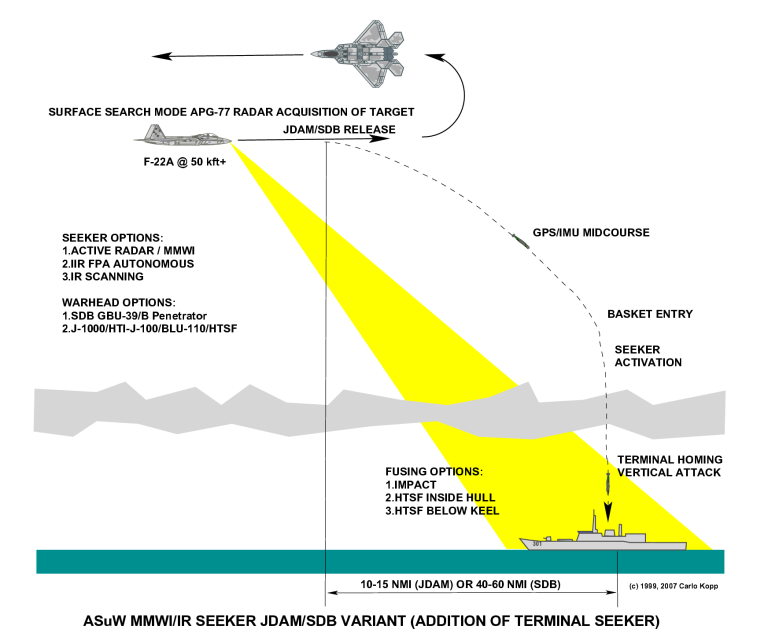 Is there an alternative way to attack warships which is cheaper and permits supersonic ingress to the target? The answer is yes. In late November, 2004, the US Air Force conducted the Resultant Fury maritime strike exercise in the Pacific. 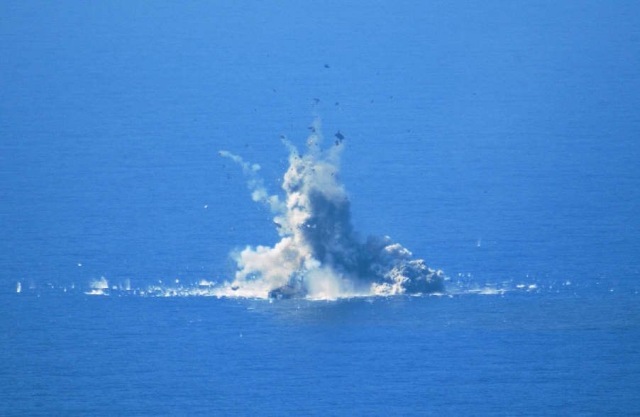 One of the aims of this exercise was to validate and demonstrate the concept of using the Affordable Moving Surface Target Engagement (AMSTE) scheme against maritime rather than ground vehicular targets. 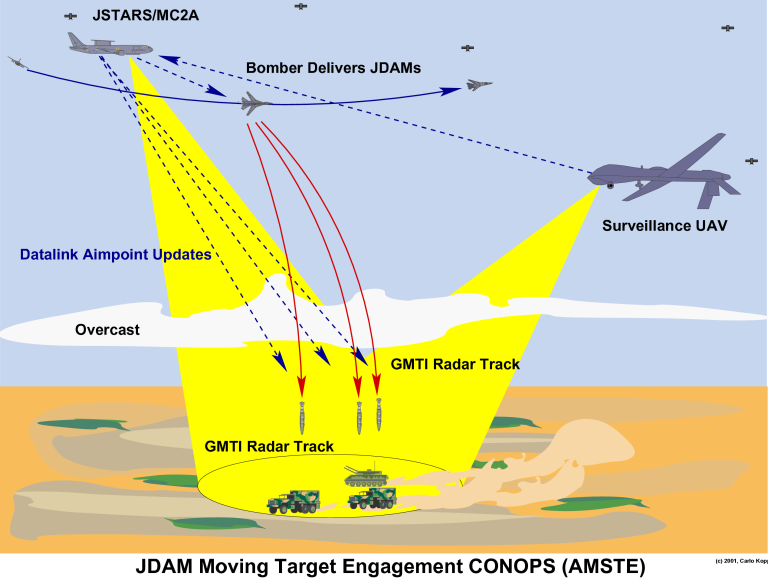 AMSTE is a scheme in which GPS aided smart bombs are adapted with a radio datalink to permit them to engage moving surface targets. The guidance system of the bomb is modified with a datalink receiver, and the autopilot altered to include a lead and intercept control law. As the bomb flies to its target, continuous target position updates are relayed over the datalink, several times per second. The bomb projects the target's position and flies an intercept trajectory to impact at the last received coodinate, fractions of a second before impact. Target coordinates for the bombs are produced by a radar equipped platform, standing off from a safe distance. Because multiple datalink channels can be used, dozens of bombs may be concurrently guided against multiple targets. AMSTE was first devised as a means of all weather attack against convoys or moving formations of armoured vehicles. These are smaller and faster targets compared to warships, and can change direction more rapidly. There was no doubt that the AMSTE concept was going to be a success in maritime warfare, and the Resultant Fury exercise proved this. 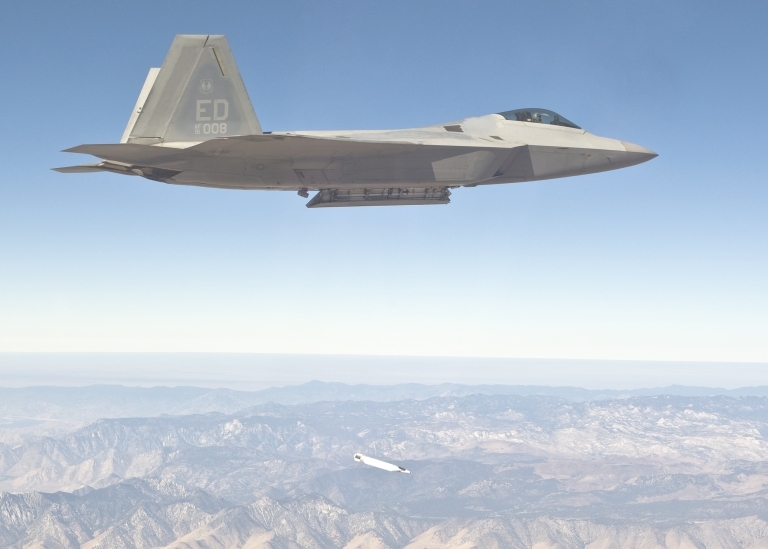 Spiral upgrades for the F-22A will include over time the capability to carry AMSTE enabled munitions, such as JDAM variants and Block II Small Diameter Bomb. This is inevitable as they are required for lethal suppression of 'shoot and scoot' Surface to Air Missile systems. By default this capability becomes available for use in maritime roles. It is worth observing that the F-22A's Block 20 APG-77 AESA radar is exceptionally well suited for this role, as it has exceptional power-aperture performance, and is equipped with hardware and algorithms for Inverse Synthetic Aperture Radar (ISAR) imaging of aerial targets. Expanding the ISAR modes to permit imaging of surface shipping is not a difficult task. Given that the planned ISR roles of the aircraft will require the addition of transmit capable datalink terminals, providing the F-22A with the capability to guide AMSTE enabled munitions is not a difficult feat. The CONOPS for this regime of attack would be the 'Hunter-Killer' model, in which a pair of F-22As would alternate roles as 'Hunter' and 'Killer', until their payload of JDAMs or SDBs is expended. Other options also exist. From the outset the JDAM was intended to be enhanced with a range of specialised seekers. To date only the laser seeker has materialised, due to demand by operators in counter-insugency strike roles. Numerous options exist for anti-shipping seekers. These include Ku-band or millimetric band radar seekers, low cost focal plane thermal imaging seekers such as the DAMASK demonstrator, or adaptations of scanning infrared seekers. A anti-shipping seeker equipped JDAM or SDB would allow completely autonomous fire and forget targeting by the F-22A. There are compelling reasons to adopt a guided bomb CONOPS for ASuW roles should they be flown by the F-22A. The first reason is cost. 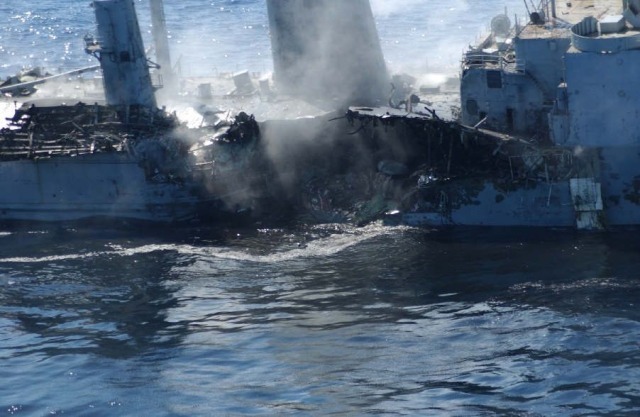 Anti-ship missiles cost between hundreds of thousands to millions of dollars apiece. 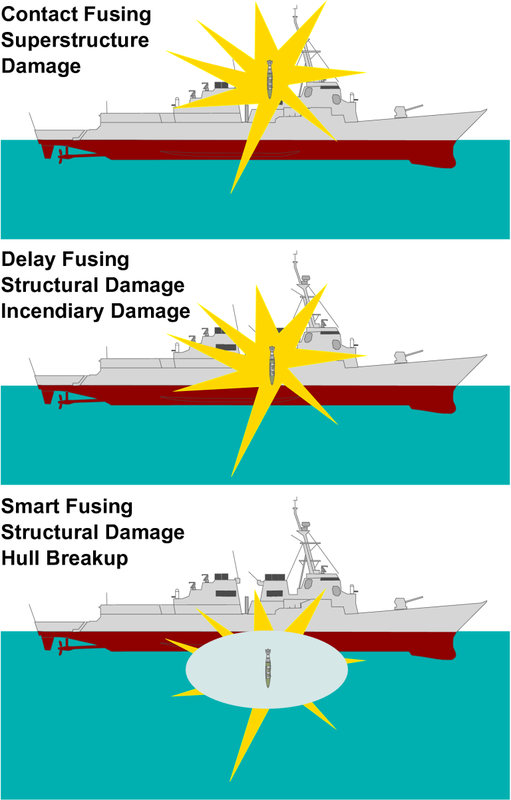 Usually multiple rounds must be launched to saturate the ASMD system on the target warship. JDAMs and SDBs are munitions in the $20,000-50,000 cost bracket, and thus saturation can be effected at much lower cost per target warship. The second reason is survivability. Modern ASMD systems are optimised to detect and engage inbound sea skimming missiles and present often formidable detection and engagement capabilities. Smart bombs flying steep vertical dive trajectories literally fly down the blind coverage funnel above a warship, presenting difficulties for defensive systems not built to engage inbound ballistic missile class threats. The third reason is lethality. A J-1000 warhead or SDB warhead is built to penetrate multiple feet of reinforced concrete, and will slice through the decks of a modern warship with ease. These weapons are akin to the munitions fired by heavy naval guns which proved so lethal during the 1940s. Technology however offers some important gains over 1940s artillery. Not only are these modern bomb warheads designed to penetrate deep, but modern smart fuses offer other possibilities, as they can sense how deep they have penetrated using an accelerometer. Of particular interest is the option of fusing a penetrating bomb to initiate below the keel of a target warship. This will inevitably produce similar damage effects to a smart torpedo detonating under the hull of the target, causing a hull breakup. In summary, there are very many ways of executing ASuW operations using the F-22A, providing a more lethal and operationally sustainable weapons system than legacy anti-shipping missiles offer. During the Resultant Fury exercise conducted late November, 2004, the US Air Force trialed the use of AMSTE-modified 2,000 lb JDAM guided bombs, with datalink updates from an E-8C JSTARS, and laser guided 2,000 lb GBU-10/BLU-109 bombs targeted by a Litening II pod on a B-52H. Upper - former USN LST Schenectady takes a hit by multiple JDAMs; Lower - damage effect produced by JDAM hits on waterline. The vessel sank 1.5 hrs later [More images at U.S.S. SCHENECTADY - OPERATION RESULTANT FURY]. 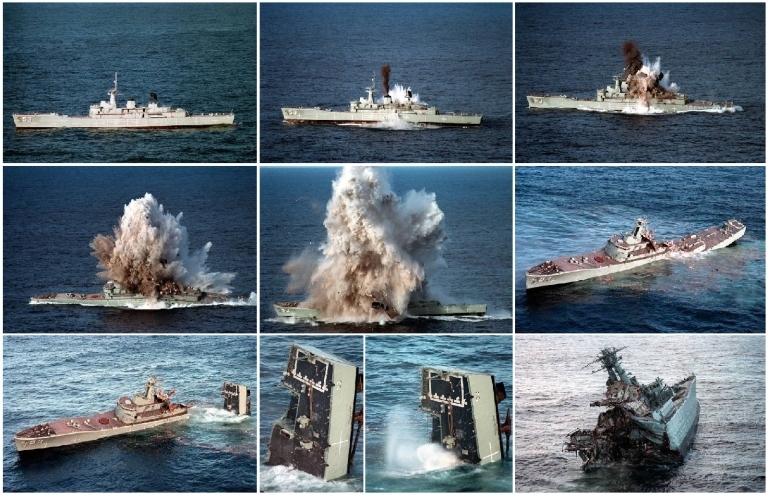 This sequence of images shows the effect of a Mk.48 series torpedo initiating below the keel of the target vessel. The expanding gas bubble breaks the keel of the vessel, snapping the hull in two. A smart bomb with a smart fuse programmed to initiate below the hull of the target would produce the same effect, but with additional hull weakening produced by kinetic damage effects as the bomb penetrates down through the hull (Image via Wikipedia).